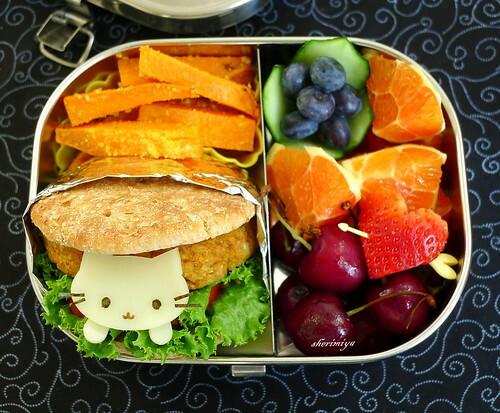 Nyanko Burger Kitty Bento, a photo by sherimiya ♥ on Flickr. Do you know Nyan Nyan Nyanko? It is a San-X kitty character which can imitate various food items. 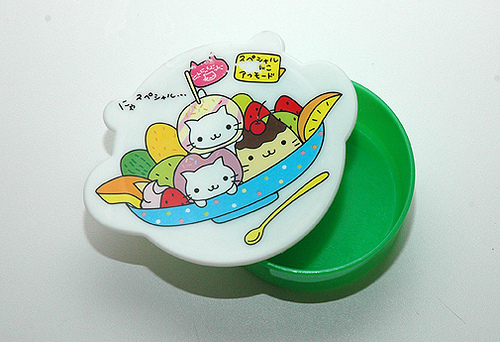 I saw this Nyanko bento box and I strongly wish to obtain it. Isn't it so cute? I have to admit, when I think of walnuts, I think of muffins and sweet treats. So when I smelled the walnut rice while making this, I had mixed feelings. Is this savory? Is it a dessert? A bit unsettling. The reason that walnuts are included is because this nut is a good source of monounsaturated fats. 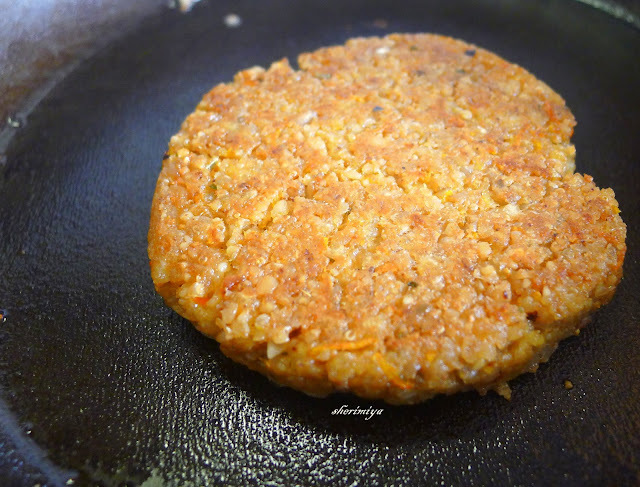 What I've found with these meat substitute burgers is that the flavor is usually so mild that the success of the burgers often depends upon the choice of seasonings you use. If you have a favorite blend (such as garlic and cumin, which I like), then maybe you should stick with that. But that's just my opinion. What do you vegetarians think? Saute onion, carrot, and garlic in a large saucepan. Mix with rice and set aside. Process the walnuts in the bowl of a food processor fitted with a metal blade until finely ground. Add the rice mixture, egg, and seasoning. Pulse until the mixture sticks together. With wet hands, roll into balls and then flatten into patties. Coat a nonstick griddle or large skillet with cooking spray and heat over medium heat. 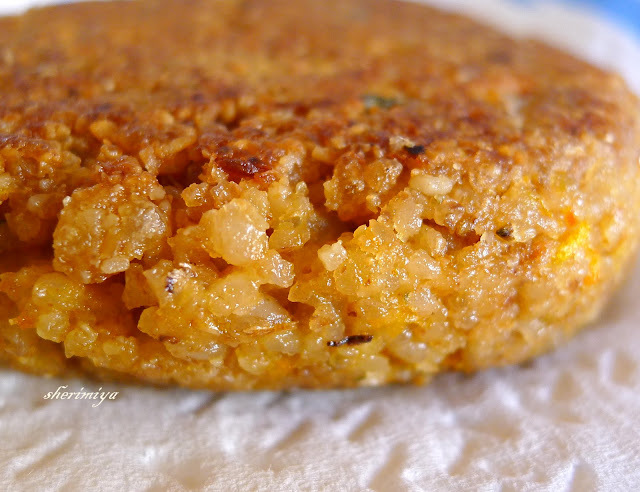 Cook the patties for about 3 minutes or until golden. Turn carefully and cook for about 4 minutes longer or until heated through. Melt some cheese on top if you like. Place each patty on a bun with a tomato slice and lettuce leaf, with mustard. Aww!! the strawberry heart and arrow is so cute!! and I spotted a cute cucumber cup with blueberries in it... you're amazing!! super delish!! I think the cuke cups might have some use after all, and they are quickly and easily carved (unlike raw carrots)! Hi, Sheri! Your tweet picked me up and had to get off the couch to read your post on the bigger screen. Thank you for sharing! This is my favorite of your bento creations! Nyan Nyan Nyanko is one of my favorite characters, and you made one out of food perfectly! I also love the strawberry heart with an arrow and the cucumber cup! Where did you spot the Nyanko bento box? Oh, are you becoming a vegetarian or just trying a lot of veggie burgers? 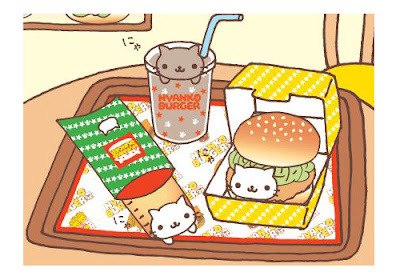 Oh my that little kitty burger is so cute!!! Am I just loving your adventures in the world of vegetarian patties...! Years ago I had a recipe for some sort of vegan meatloaf, which looked oh-so-made-from-meat and it was packed with walnuts...wish I could get that recipe again and try as hamburgers. You totally inspired me! So cute Nyanko kitty! Always thought it´s "ok" to make charaben and edible "animals", however Nyanko characters always cracked me up :P.
Sweet cuke cup and double lovely heart! Happy Feb ❤! Those Japanese animal-as-food-creatures are all so funny. Wonder why so popular (Anpanman & friends too)? And wonder why we don't have any in the US ... do we? Hmmm. Nyan Nyan Nyanko is my favourite character, but then again, I am a sucker for all catlike kawaii things :o) Your veggie burger adventure is most interesting and an inspiration for me as well. I'll have to give them a try this weekend (together with Megan's vegan patty). Me too I love kawaii kitties! Super fantastic cuteness, I LOVE sweet Nyanko and the dazzling fruits *strawberry heart!! * Inspired by your vegetarian creativity, infused with such joy and color. Thanks for brightening my day with this post! Thank you for bringing a smile to my day with your sweet comment Jenn! yum, these burgers sound wholesome and filling, and look delish! i like walnuts in both sweet and savory applications, but i can understand your initial hesitance... seems like it worked out though! nyan nyan peeking out is just too cute. I've never heard of Nyan Nyan Nyanko, but it looks adorable...! Thank you for introducing me to another cute San-X character :)! Funnily enough I was just about to make some nut burgers and a cat bento (separately)! ^^ This looks so amazing! Your Nyan Nyan Nyanko is precious! I am truly loving your vegee burger posts lately. I still haven't made any of my own but I want to soooo bad. This looks delicious! I've used almonds in savory cooking before but never walnuts, I associate them with sweet stuff too, lol. I am hooked on veggie burgers, but I think we'll be eating some meat this week to balance it out, heh. Wow, that looks amazingly mouth-watering!! Unbelievable how you can come up with these awesome recipes. 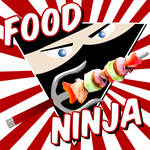 Thanks Chantale - I'm learning a lot about how you can make a burger out of all kinds of crazy foods! Hehe! Thank you Mrs Llante N! !